"It is not well understood why a (Romanian) company such as this would collect broken LCD screens from Ireland, and then, many months later export them to Hong Kong. Nevertheless, the device appeared in one of the well-known New Territories electronic junk yards in Hong Kong in the notorious Ping Che area," the report said. Recyclers are permitted to sell-on equipment that is tested individually and certified as working and fit to be traded as 'second hand'. 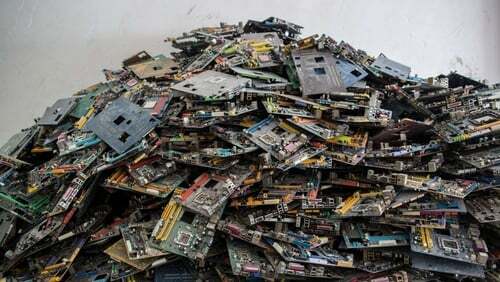 "BAN calls upon the EU not to corrupt the worthy goals of the Circular Economy to use that term of art as a new password for increasing externalization of costs and harm to developing countries through liberalising trade in broken, non-functional electronic waste with a new 'Repairable Loophole' in the laws of Europe or at the Basel Convention," it said. To complete its project BAN worked with agencies across Europe including the RTÉ Investigations Unit to monitor electronic waste movements from local depots and produce the report published today, 'Electronic Waste Holes in the Circular Economy: WEEE Leakage from Europe'. "The answer to criminal activity is not legalising that activity but rather improving enforcement to ensure the future health of Europe is not dependent on poisoning the rest of the world," Mr Puckett said. "Chemicals (from burning this material) are extremely toxic and carcinogenic, rendering the 'waste management' a form of hazardous waste generation -- rendering an environmental outcome far worse than the original materials," the report said.